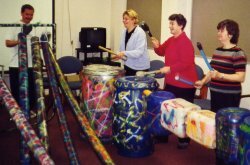 Big Beat offers a range of performance and workshop solutions that are suitable for a wide variety of corporate events. We are highly flexible and can adapt to all types of events and venues. What we offer is by no means standard - but in order to give you a more concrete idea of what we can provide, this page aims to give you a detailed overview of our four most popular formats. All timings are flexible and can be modified depending on the requirements of the specific event. Suitable for training programmes, teambuilding days, conferences, etc. Participants / delegates are together in a central location. 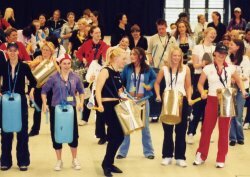 Participants / delegates are then put into pre-arranged groups (ideal size 15 - 25) and assigned to a designated workshop leader (member of Big Beat). Groups then move to breakout rooms containing preset workshop instruments. Suitable for training programmes, teambuilding days, conferences, corporate events and functions, etc. Participants / delegates / audience members are together in a central location. optional - The band continue to play 2 or 3 more numbers, with the audience joining in with their instruments. Suitable for corporate events and functions, conferences, awards ceremonies, product launches, wake-up calls, festivals, live performances, etc. The band perform for anything between 5 - 45 minutes. Energising the audience, providing funk-fuelled entertainment and generally making a resounding percussive impact on all those watching! The band can perform a number of sets in a day!